It takes up to $360 per month on average for one national missionary to be fully supported through GFA World. By giving $30 per month to GFA’s National Missionary Program, you would be partnering with these missionaries and impacting Asia together with them. 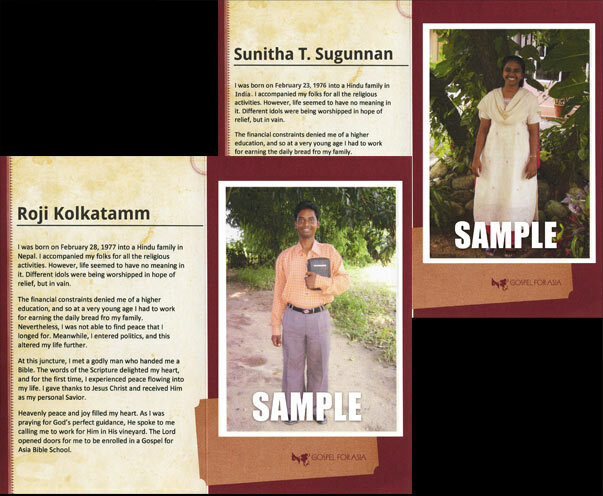 For every $30 monthly commitment you make, you will receive a photo and the personal information of a missionary you can pray for. What does my $30 pledge provide? While it takes up to $360 to fully support one national worker, your $30 pledge is one part of the program that helps provide for our brothers’ and sisters’ ministry needs as well as living and family expenses. We'll be glad to assist you. Call us at 1-888-946-2742. GFA World conducts our ministry with the highest standards of financial accountability in managing the funds entrusted to us by God's people. This has been our practice from the beginning.